Lalitha Aunty serves kiribath for breakfast. Kiribath is a soft rice pudding that is then formed into a cake. It is made with coconut milk, rice, and salt. Kiribath is the first solid meal served to babies and the first food eaten in the Sinhala New Year. At Lalitha’s house, it is eaten every day. Kiribath is rich and creamy, salty and slightly sweet. We ate ours with Seeni Sambol, Miris Maalu, and Maalu Kiri Hodi, Sear fish in sour and a yellow curries. In Sri Lanka, curry is a breakfast, lunch and dinner affair. After breakfast, we had mangoes. Amma just said it is the season. We should find more as we head south. Kiri means milk, often coconut milk. Bath means rice. Maalu means fish. Hodi means gravy. Goraka is a soft brown seed used as a souring agent in Sri Lankan curries. Maldive Fish is a dried tuna flake from the Maldive Islands that adds a savory element to many Sri Lankan curries. Rice, water, coconut milk, salt. Place one cup of rice in a pan. Place your finger on top of the rice and add water up to the second joint. Bring to a boil, reduce the heat as much as possible, cover, and cook over very low heat until the water is absorbed. Once the water is absorbed, add the coconut milk and salt and cook over low heat, stirring constantly, until the mixture no longer sticks on the sides of the pan. 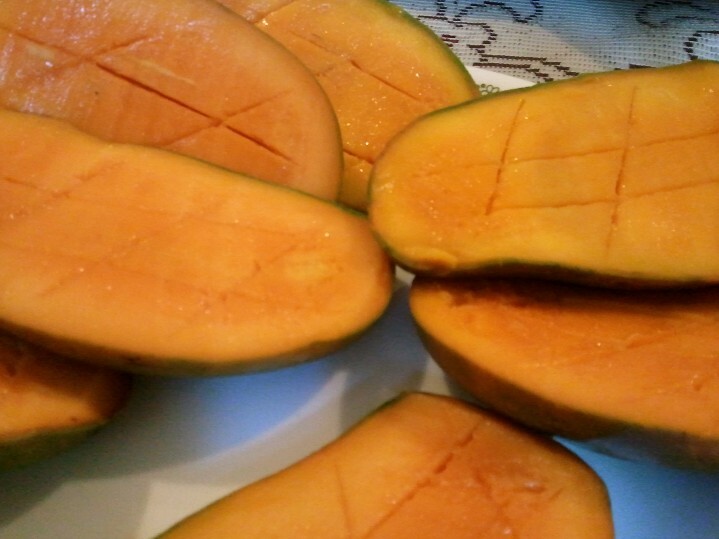 Pile the kiribath on to a plate and use the back of your spoon to smooth it. Slice in diamonds and serve with Pol Sambol. Sear Fish, (or King Makerel) cut in thin steaks, lime juice, coconut oil, minced ginger and garlic, curry leaf, chilli powder, goraka paste, salt, & water. Wash the fish with key lime juice, rub with goraka paste and salt, then heat a little oil with ginger, garlic and curry leaf. When they begin to brown add some chilli powder. To this mixture add the fish and enough water to barely cover. Oh my! Such a variety of flavours for breakfast! 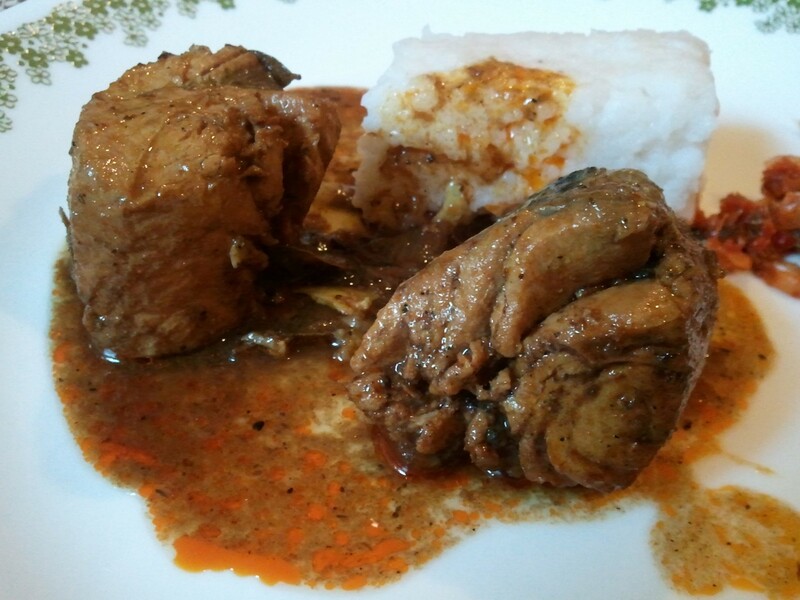 Just had to google kiribath (Sri Lankan living abroad – planning to make some for dinner just because) and that pic of kiribath with fish curry is just pure evil. I’ve some leftover chilli chicken curry in the fridge and can’t wait to get home and cook!! I’m glad you said Hi. It was really delicious–did you manage to make some yourself? I’ve been thinking of writing a post about bibicam…I have a good recipe that works pretty well with ingredients we can get outside of Sri Lanka. Now I am getting hungry! Hungry? Now I am starving! I’ve had good luck mixing maple syrup and molasses to get the smoky flavor of good panni. Would you mind sharing your recipe? I love cashew nut curry but I can’t find green cashews here, so we soak regular ones. You? I finally got a seeni sambol made which my husband said was “correct.” It took several tires. I have a friend who makes fish cutlets, but I have never tried them. Do you make those too? Sorry for the long delay. I had couple of deadlines this week–but I would have much rather been cooking. Especially after I saw your cashew nut pics. What kind of filling do you used for the cutlets? I can never get that right.